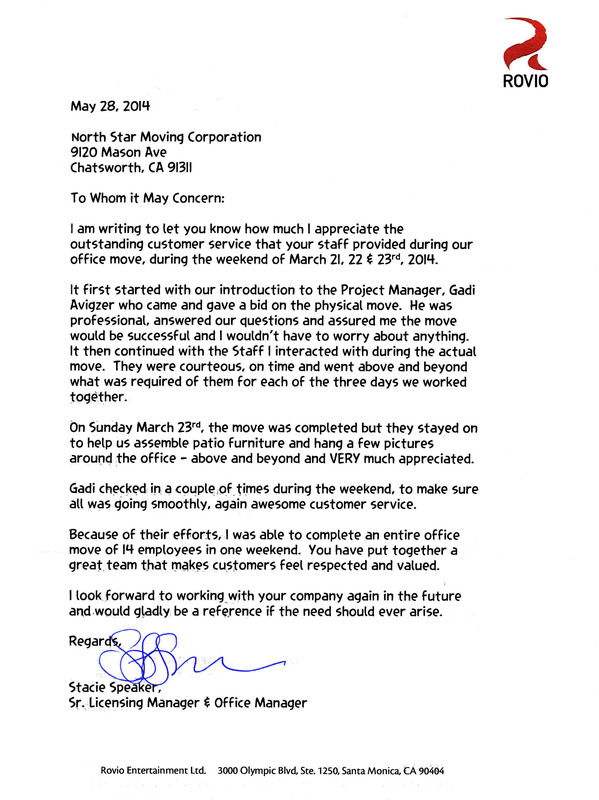 I am writing to let you know how much I appreciate the outstanding customer service that your staff provided during our office move, during the weekend of March 21, 22 & 23rd, 2014. It first started with our introduction to the Project Manager, Gadi Avigzer who came and gave a bid on the physical move. He was professional, answered our questions and assured me the move would be successful and I wouldn’t have to worry about anything. It then continued with the Staff I interacted with during the actual move. They were courteous, on time and went above and beyond what was required of them for each of the three days we worked together. On Sunday March 23rd, the move was completed but they stayed on to help us assemble patio furniture and hang a few pictures around the office – above and beyond and VERY much appreciated. Gadi checked in a couple of times during the weekend, to make sure all was going smoothly, again awesome customer service. Because of their efforts, I was able to complete an entire office move of 14 employees in one weekend. You have put together a great team that makes customers feel respected and valued. I look forward to working with your company again in the future and would gladly be a reference if the need should ever arise.